If you’ve ever consumed the tripe that is passed off as Lambic here in the States, then you might want to consider having the real thing. 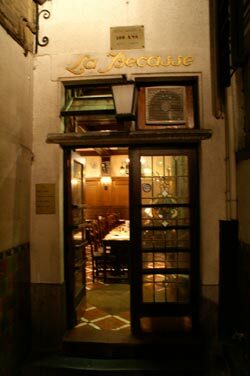 I always thought I hated Lambic until I went to Brussels – to an ancient bar at the end of a tight little alley barely wide enough to walk through. The bar was called La Bécasse, and it has changed my perspective on this wonderful style of beer. As with many things of value in this world, the atmosphere is one of the most incredible parts of the story. While most of the cafes and bars in Brussels are located in these cool little houses that are just a few feet wide and several stories tall lining the cobblestone streets for miles around the Grand Place; La Bécasse is almost impossible to find unless you already know where it is. A tight little curved alley takes you a hundred feet or so away from the crowded street. At places the alley is so narrow you can reach your arms out and easily touch both sides. The alley ends in a door set into a façade that is clearly very old. In fact, there are two façade that are visible from the alley; the current one, and a much older one behind it. Stepping inside, my Belgian friend who was with me at the time informed me that this bar is the oldest in Brussels. Judging by the centuries-old architecture everywhere in Brussels, that is not an insignificant fact. In fact, the bar was established in 1793, making it well over 200 years old. From the perspective of this American, that is just really incredible. The mood in the place is distinctly Belgian. There is no loud music blasting into the bar – it is subdued, the ceilings are low, the people avoid eye contact, and everyone talks in a low voice. The interior is wood and brick and copper. The tables are long, wooden and have high-backed wooden chairs. It is a truly gorgeous bar. 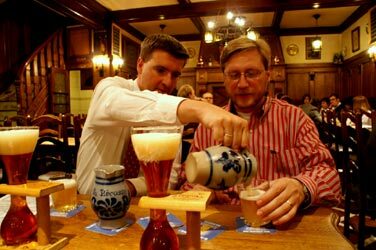 The picture here shows my Belgian friend Luc pouring me a glass of the Lambic from one of the cool little ceramic jugs (we also had a couple glasses of Kwok for dessert as you can see). I feel fairly confident that I was the only person in the entire city who was wearing a red striped shirt that day. So, let’s get down to the beer. Usually if you can find good Belgian Lambic in the States, it comes in a tiny little bottle roughly equivalent to 7 ounces, and it costs about $8. Not so at La Bécasse. You get a little jug all to yourself, and there is plenty in there to have a nice drink. If you are not familiar with Lambic, it is a style of beer that is brewed using wild yeasts and bacteria. In stark contrast to the method of producing most commercial beers, many Lambics are fermented in open fermentors that purposely allow certain types of bacterial infections to occur in the beer. Traditionally, a brew house in Belgium will brew their beer in the upper floors of the house, and serve it on the ground floor. The wild yeasts live in the ceiling and rafters of the roof. As a result, the beer can only be made in that place, and no two batches are ever exactly the same. Lambic is served “live”. The product is not filtered or pasteurized, and the character changes over time. The brewmaster monitors the Lambic and when the time is right, it is served. This is the reason it is almost impossible to find good bottled Lambic. The taste simply does not survive the bottling process. La Bécasse Lambics are smooth, not harsh like the junk you get in the States. The fruity versions have a lot of character, but the fruit doesn’t blow the drink away. It is balanced, just as it should be. I sampled their Faro (a Lambic that is sweetened with brown sugar), and the Framboise (a raspberry version); both were absolutely delicious, and had me contemplating – if only for a moment – how much a flat in Brussels might cost, and would it maybe make sense to … oh, that wouldn’t make sense. Here’s the bad news. If you want to try La Bécasse then you are going to have to travel to Brussels. They simply do not bottle it. You can only get it by going to the source, walking down that long narrow alley, and ordering up a jug for yourself at the bar. If you do, you will not be disappointed. Stepping into La Bécasse means stepping back in time over 200 years into a bar that was established 11 years before Napoleon crowned himself Emperor of France.